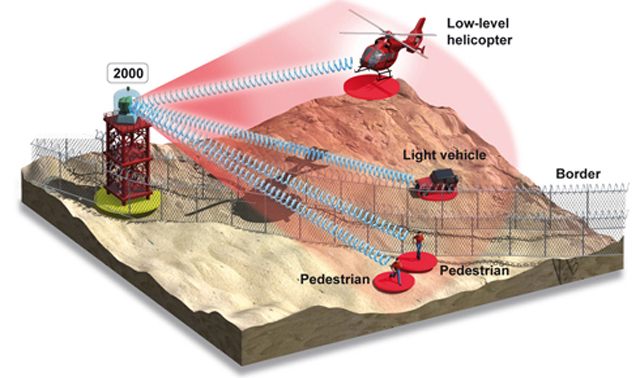 The Airbus Defense and Space-developed SPEXER 2000 radar is an advanced system to support homeland security and border control operations in a wide range of environments. Designed for border surveillance and security applications facing asymmetric threats, SPEXER 2000 can be deployed either as a fixed or mobile land-based system, mounted on a mast or tripod. It automatically detects and classifies multiple ground, marine and low-flying aerial targets, including ultra-light aircraft. SPEXER 2000 is the first operational land-based surveillance radar equipped with Active Electronically Scanned Array (AESA) technology, which provides an advanced dual-beam capability for superior performance. By leveraging this capacity, SPEXER 2000 is able to track a single target while still performing multi-sector surveillance, representing a key advantage over conventional reflector antenna radars. In addition, the SPEXER 2000 radar is more adept at tracking slow-moving targets due to the design of its antenna, which does not have to rotate during operation and scanning procedures. SPEXER 2000 is able to consistently monitor wide areas and very long distances during both night and day, and can be fitted with an optional air-conditioned radome for protection against sand storms and extreme temperatures. The radar meets International Commission on Non-Ionizing Radiation Protection (ICNIRP) regulations and features low power emission, making it safe for operation in populated areas. In service with militaries and security forces around the world, SPEXER 2000 has demonstrated its capabilities in integrated border security systems, successfully detecting asymmetric as well as traditional border security threats.